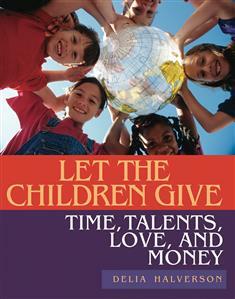 Let the Children Give provides adults the resources to demonstrate and teach a stewardship lifestyle to kids. Stewardship is more than a church committee assigned to raise money for the budget. Christians are expected to act as responsible caretakers of everything we've been given by God. All have abilities to accomplish this work, and the apostle Paul reminds us that everyone, including children, must work together. Each of us holds an important role in Christ's mission. "With our abilities and talents, we can manage the earth," writes Halverson. "We can also manage our health, property, time and relationships. …We do not grow spiritually without giving, not just monetary giving but giving of all of our gifts. We were made in the image of God and entrusted with the care of the earth and all that's in it, from the ozone to the starving child." As a special bonus feature, Halverson created a mini-retreat designed for parents and children together to learn about stewardship. She discusses congregational stewardship plans from a biblical and historical understanding, and offers ways to include children in those plans. Children, their families and your whole congregation will be better equipped to accept the call and challenge to a more holistic stewardship through a study of this book. This is a great book for Christian education committees and stewardship committees!